Finding time to step back from your hectic day isn't easy. With so many things to do, and so many different ways to do them, sitting down for even five minutes of mindfulness or relaxation seems out of the question—which is where Headspace and Calm come in. These popular meditation apps base their products on helping users find the time to practice a more relaxed and stress-free lifestyle through guided meditation. But which company's pricing strategy has really found its center? 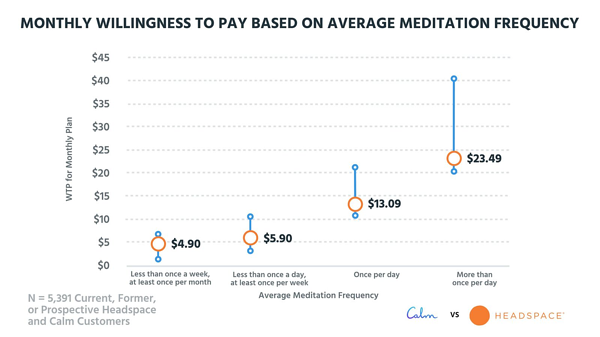 In this week's Pricing Page Teardown, Peter and I dig into the data to see how individual users' meditation practices affect their willingness to pay. We talk about how Headspace is in a position to start niching down and why Calm should consider adding freemium to their pricing strategy. Both companies have a package we're calling their Forever Price. This is a one-time payment of $299.99 for Calm and $399.99 for Headspace that more or less locks in customers at a set lifetime value (LTV). It's interesting to see that while both companies offer this option, Headspace is definitely going more premium than Calm. Starting with Calm, we took a look at their home page and pricing options to see how each company was positioning their product. The focus on simplicity and the app being a user's first step to a more mindful meditation practice makes it all about the customer. That's what is selling their product for me at least—and who can deny their overall design aesthetic? When it comes to pricing, Calm is much less robust. They offer a Forever price like we talked about and an annual package. There's no real mention of a monthly price at all. They also offer a 7-day free trial for prospective customers. This is where you see the premium coming in. With their Lifetime package coming in around 30% higher than Calm and their annual boosted almost 50%, Headspace is positioned a bit higher overall. They also feature a monthly package, which is a bit more enticing for some customers. Where I think Headspace kicks it up a notch is with their freemium option. We've seen in the past that this packaging typically has a positive impact on customer acquisition costs (CAC), LTV, retention, and Net Promoter Scores (NPS) over the option of a free trial. Customers who start out on the freemium package end up being more valuable in the long run. The more often a user meditates, or the more time they spend doing so each day—the more they're willing to pay. That's not all that surprising, we saw this with Planet Fitness and Equinox as well, but the lift for habitual users is a huge opportunity for both companies. Let's take a look at the monthly willingness to pay based on average meditation frequency. We surveyed 5,391 current, former, or prospective customers of Headspace and Calm and found that both apps are pricing their product much higher than the average for an occasional user. 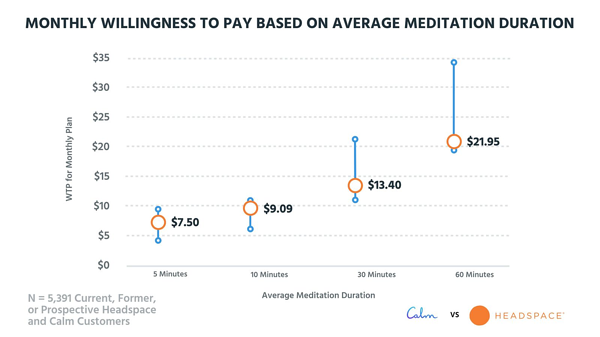 For users that meditate less than once a week but at least once a month or less than once per day but at least once per week the willingness to pay is $4.90 and $5.90 respectively. There are even some survey respondents that fall even further down on the left side. It's really the once per day and more than once per day users that are going to see the value in either app's subscription pricing. Calm is definitely in a position to own the less frequent users with their slightly lower price point. That said, their pricing is still a bit off—by only offering annual subscriptions, Calm makes it harder for potential customers to move forward with the purchase. The longer commitment is a potential blocker. Headspace bypasses these issues with their freemium option, but it turns the competition into more of a conversions game. 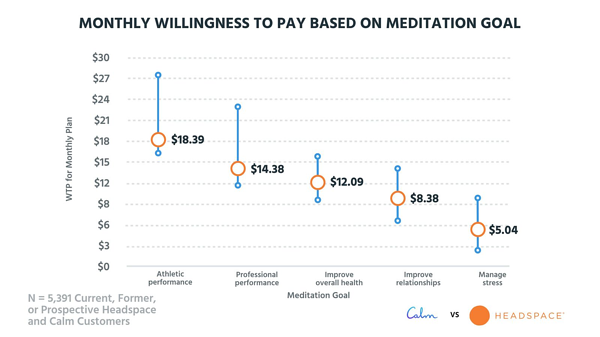 We see a similar curve for willingness to pay based on average meditation duration—the longer the meditation, the higher the willingness to pay will be. What's interesting about this data is the people who are meditating for just five or ten minutes. Their willingness to pay is objectively pretty high for such a short period of actual usage. As I alluded to earlier, we're seeing a big lift in average willingness to pay for habitual users. Someone who is meditating at least 60 minutes is sitting at $21.95 but swings almost up to $35.00. The same goes for someone who is meditating more than once per day; they start out at $23.49 but are willing to go as high as around $41.00 a month. Both Headspace and Calm could easily start boosting their average revenue per user (ARPU) considerably by offering a premium tier for these customers. Right now, each company only differentiates on length of subscription, which doesn't leverage the potential for expansion revenue that we found in the data. When we take a look at the reasons why people meditate, it brought up some interesting questions about how Headspace and Calm position their value propositions and marketing copy. A users' goals tend much more towards optimizing their performance at work or in their personal life, as opposed to just finding a way to relax. It's those outcomes these apps should focus on moving forward. Take a look at the monthly willingness to pay based on meditation goal. We see that Athletic performance comes in with the highest willingness to pay at $18.39, but it could go as high as $27. Professional performance and a want to Improve overall health are just below that with $14.38 and $12.09. Once we move into Improve relationships, the average willingness to pay starts to dip below the $10 mark, with Managing stress coming in dead last with only $5.04. Shifting their positioning to talk more about how meditation positively affects performance in a number of different aspects of the users' daily lives does a lot in terms of boosting the potential willingness to pay for both apps. Calm does this a bit with their Calm Body option, but it's not the central focus of their website copy at all. We see this pattern reflected when we chart average willingness to pay in relation to relative feature preference as well. A Stress Session lands squarely in the Core Features quadrant, meaning that customers really just expect that feature to be available. 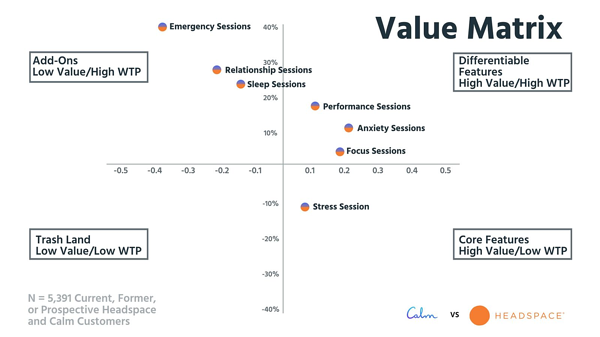 The Performance Sessions, Anxiety Sessions, and Focus Sessions are where Headspace and Calm could start boosting their expansion revenue. As Differentiable Features, users are more willing to pay for an additional tier or product offering. When we get into the Add-Ons quadrant, it starts to get super niche in terms of what each app could potentially offer. Willingness to pay is lifted way up there for Emergency Sessions, but we don't think that would really be a good plan for either app. Neither app would get anything from charging extra for a session intended to curb or relieve a panic attack. This data tells us that Headspace and Calm are really just going after the lowest common denominator right now. But as players in a new niche of the wellness market, it's not all that surprising. There's a lot of opportunity for growth and more specific targeting for both apps as they mature. Which meditation app really helps you find your chi? We saw some really interesting patterns in the data today and it's time for Peter and I to let you know which app we think comes out on top. As a previous Calm user, and current Headspace user, I'm a bit biased towards Headspace as their friendly marketing and design choices speak to me as the user. That said, I can certainly see how a voice-guided meditation might not do it for everyone. Peter recognizes that there's a considerable amount of overlap in functionality, but the warm and welcoming feeling of Headspace appeals to him as a user. As an investor, Peter thinks there's a definite possibility for both companies to win. I would go more for Headspace, because they're objectively in a better position right now based on where the market is. As both apps are essentially content companies, their best bet moving forward is figuring out different ways to differentiate based on the quality of their content.